Utrecht and Mother Goose have lots to offer. If you're looking for more than just a city trip, then why not add a little extra to make your stay unforgettable! Get ready for the must-see attractions of Utrecht, do you want that extra special wedding night or just a super relaxing stay under the wings of Mother Goose? We've got it all! Mother Goose loves love... So much that she has put together a special experience for lovedoves! Let us spoil you with our I GOOSE YOU package, whether you're here to celebrate your wedding night, or just planning a romantic getaway. 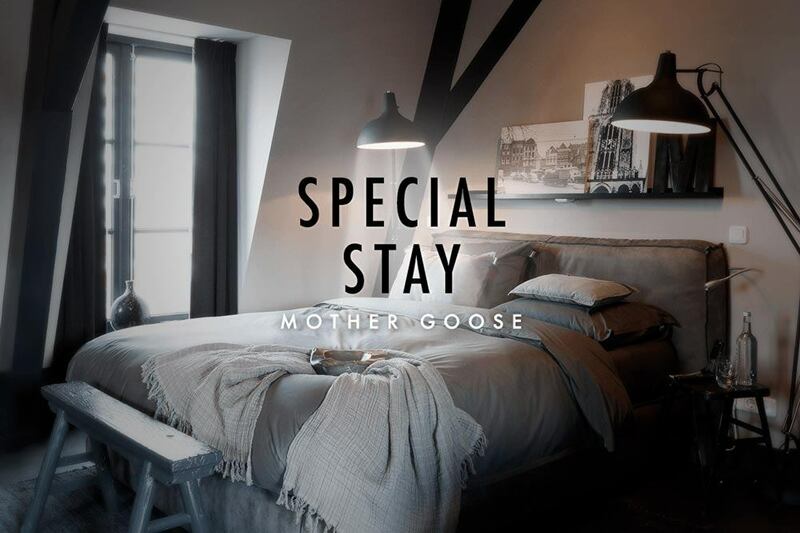 Mother Goose has thought of every possible way to make you feel absolutely spoilt, from a stay in one of our Goose Suites with a breathtaking view of the Dom Tower and a bottle of champagne, to delicious (and all natural) Lush products. Your Mother Goose experience will be an all green treat for you and your one special person. Do you have a preference in terms of the colour of the Suite? Let us know! We will do our very best to make it happen! To Mother Goose there is no greater joy than to pamper her guests and to provide them with the best tips to enrich their stay. Being able to work with Five City Spa to offer guests a relaxing package thus makes her very proud! Five City Spa is more than Goose-worthy: a veritable treat for all senses! Located in the hip and local Wittevrouwen area, Utrecht’s finest spa is an oasis of calmth where relaxation is sacred. It's beautifully designed spaces, a wall of real moss, delicious Kusmi tea and professional masseurs who are passionate about their craft make a massage at Five City Spa a memorable experience. Because relaxation is very personal, Five City Spa offers five heavenly massages (i.e. a special Pregnancy, Mommy or Duo Massage) and five facial treatments (even one dedicated to the male skin) and a pedicure for you to choose from! Extend your little moment to yourself with the delicious Kusmi tea served at the magazine-laden table and slowly make your way back to Mother Goose through the historic centre of the city. *Upgrade your package to a Mother Goose Large +€ 15,00 or Suite +€75,00 per room per night. DOMunder is a populair activity, therefore we recommend booking in advance. Closed on Mondays.